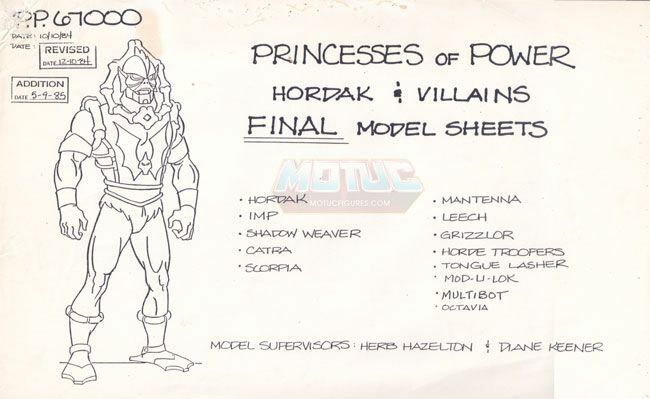 Masters Of The Universe Classics: New Site Feature- Filmation She-Ra Model Sheets! Hey everybody! I recently purchased a nice collection of Filmation She-Ra model sheet packets and I thought you guys might enjoy checking them out with me. There are entire folders dedicated to She-Ra, Bow, and Swiftwind... as well as a stack or two of Horde members! Some characters only have a page or two of turnarounds, while others go into every little detail. Really cool stuff! I'm kicking things off by scanning in the Horde sheets first. I figured it would be cool to let you guys tell me which member you'd like to see me start with. So take a gander at this cover sheet and tell me where to start! Awesome! Though Im most impressed by the title 'Princesses of Power'. a nice tie in with Masters!